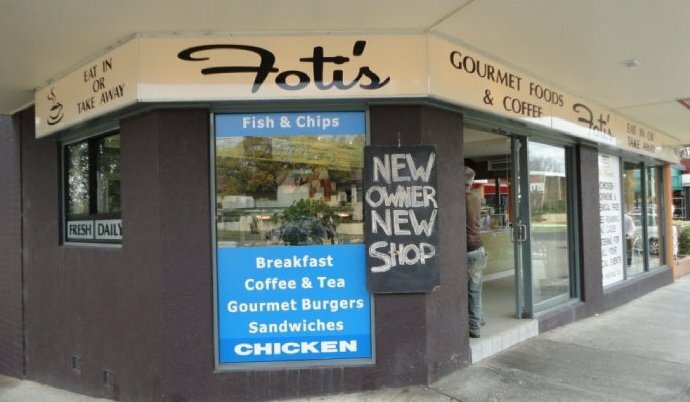 So there I am, sitting back, savouring a chicken schnitzel burger with caesar sauce and home-made chilli, made by none other than the famous Foti himself. It's that rare type of meal where each bite is somehow tastier than the last, completely defying the laws of both physics and Huey's Cooking Adventures. I start wondering whether or not "Foti's" is an acronym for "Full Of Tasty Ingredients"? Actually, I'm not wondering that at all. It's actually just an abbreviation of the owners' surname. But top and tasty ingredients are aplenty here, along with pronto service and generous prices. So here's some advice for the weekend: get your arse into gear, head towards Lane Cove, cruise down Burns Bay Road, find yourself an easy park (plenty around), walk straight past the poor excuse for a cafe right next door to Foti's (unless you like forking out $25 for something that looks remarkably similar to Ronald McDonald's "Big Breakfast"), place an order at Foti's, and enjoy your meal while pondering the great mysteries of life. Or reading the Telegraph. (Rumour has it they also serve a top-shelf bacon & double-egg roll coffee combo around breakfast time. Some day, I hope to wake up before midday to verify this). Why? Bloody good burgers, all types of meat & fish, with diamond coffees to top it off. Hi, yes Fotis rocks! It was a staple place to visit while we were doing renos on our new house in the area. And I went there today for a nice coffee. And I totally agree about walking past the cafe next door as the food is overpriced and not that good for the money. I only go there when Fotis is closed, and only for coffee. I can confirm the bacon and double egg roll is a winner, I get mine on a Turkish roll ... Dammit, now I want one!